The Cat Show was inevitable: an art exhibition devoted to the feline as internet meme, domestic partner, and kitsch icon. Contemporary cat tropes were as bound to spill into art spaces as the boom of advertising was irresistible fodder for the “pictures generation” forty years ago. The temptation is to dismiss The Cat Show, now on view at White Columns, as pandering: like a motorcycle exhibition or Harry Potter at the Discovery Center. The Walker Art Center presented a wildly popular Internet Cat Video Film Festival last year, and the Brooklyn Museum is presenting an exhibition on Egyptian cats later this summer. Throughout the White Columns exhibition it remains intriguingly unclear how seriously the whole project takes itself, but moments of sincere cat devotion suggest substance in this populism. The exhibition itself packs the gallery with over a hundred pieces by famous artists, not-famous artists, and non-artists: a dizzying and democratizing presentation. 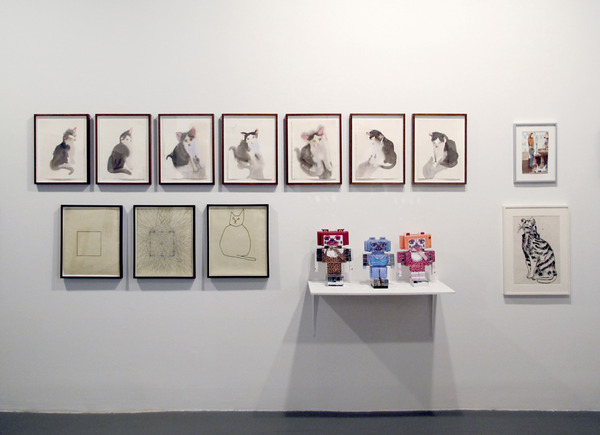 The Cat Show forces attention away from individual artists towards the theme (becoming the proverbial "cats-in-art show"). In part because of the selection of the curator, and in part because of something in the nature of representing cats, some unsettling resonances emerge between the works. Cats are associated with messy things in our society: madness and isolation, snobbery, idolatry; more recently, this list includes bad grammar, puns, internet message boards, and bad painting. The Cat Show captures all of these. 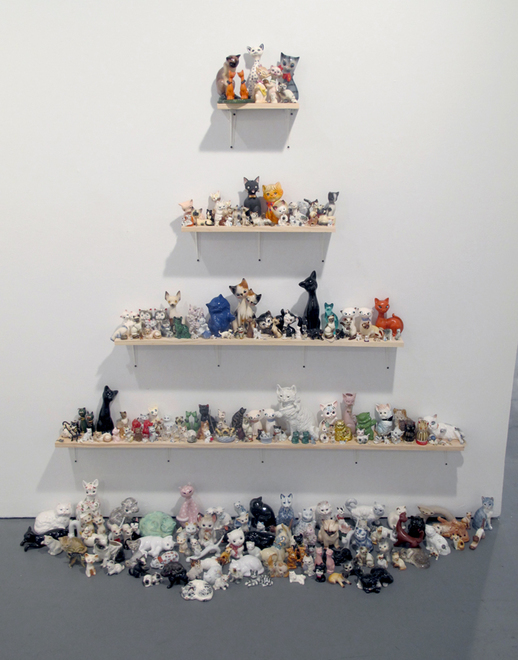 An altar-like display of cat ceramics from the collection of writer T. Cole Rachel dominates one wall of the exhibition. The assembly could be taken from your aunt's house: an assortment that shows years of care and searching. In a short video, Junior, Gus Van Sant plays guitar while his cat chases the light that reflects from the guitar’s pickguard. The cat seems to be doing a jig to the bluegrassy music. It has the look, feel, and ethos of a YouTube video, but it was made in 1989, more than fifteen years before the LOLCat explosion would similarly anthropomorphize cat expressions. Cory Arcangel’s Drei Klavierstucke op. 11 functions as a meta-cat video: he samples individual notes from YouTube videos of cats jumping on keyboards to form the eponymous compositions by Arnold Schoenberg. The juxtaposition is doubly unsettling: Arcangel brings random cats together to recreate pieces that, because of their atonality, sound random to the classically-trained ear. 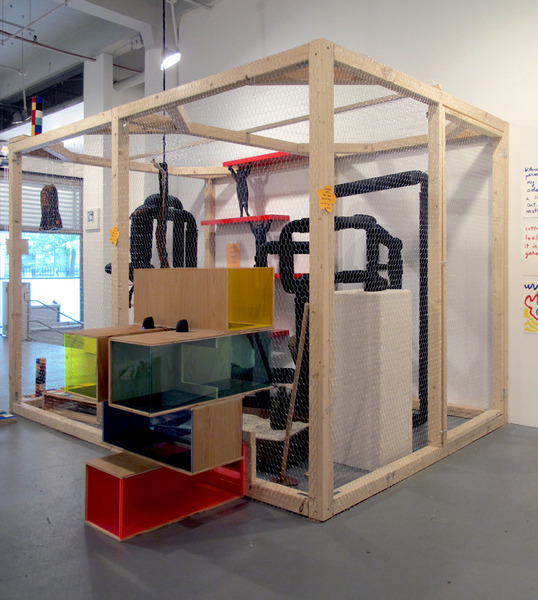 The centerpiece of the exhibition is a large cat habitat by Freecell and Gia Wolff, a PVC structure for cats to enjoy while awaiting adoption. The piece invites us to imagine these cats in our home, which, after all, is the imperative of the exhibition. Domesticity is the unspoken link between all things cat. We imagine cats lounging on furniture, sharing our spaces; they are natural companions to chair-bound internet junkies. In his “Anonymity as Culture” series for Triple Canopy, David Auerbach speculated that internet forums, including LOLCats, serve to “reify a shared and progressive sense of culture and belonging that trumps differences among individuals.” The Cat Show brings one of those communities into the daylight but maintains the internet's impersonality, muting individual artistic visions in praise of the cat.